1-1/2 Gallon - Covers up to 600 sqft. Description - Armorclad Master Kit w/ Topcoat is one of the highest grade epoxy floor kits on the market today. So, why is this epoxy considered the gold standard? That is due to its unique 100% solids Adaptive Molecular Technology which allows the epoxy to bond better than any other epoxy on the market today. Armorclad can be applied to any properly-prepared surface and covers 600 sqft making it great for garages, basements, works spaces, factories, and much more. A 1-year warranty backs Armorclad Master Kit w/ Topcoat. Kit Contents - ArmorEtch etching solution, 3 gallons of 100% solids (the finest available) 2 part epoxy, UltraGlaze 1-part industrial-grade non-yellowing clear topcoat, Clear Grip Non Skid Additive, 6 lbs of decorative epoxy flecks, rubber gloves, industrial-type mechanical mixer (for your drill), mixing sticks, application squeegee, roller pad, instructions, and brush (for corners and edges). Comes packed in a reusable 6 gallon heavy duty mixing bucket. Coverage - up to 600 sqft. Kit Weight - Approx. 65 Lbs. Recommended Uses - Armorclad Master Kit w/ Topcoat is great for both commercial or residential use and has been used as a flooring surface for garages, kitchens, basements, workshops, as factory flooring and much more. Armorclad Master Kit w/ Topcoat is very easy to clean and maintain. We recommend periodic mopping of the flooring surface with cleaners that contain no bleach followed by rinsing the floor with clean, clear water. Installation of Aromorclad Master Kit w/ Topcoat is very easy to do and can be accomplished by a DIYer or a professional. Below are the instructions for the subfloor prep and for the installation of your new epoxy floor. Covers 600 sqft. (2 Car Garage Floor Kit). Need a little more than 600 sqft.? Then purchase an Armorclad Add on Kit w/ Topcoat. Covers 300 sqft. Can this be applied on a floor with cracks that have been sealed? Armorclad Master Kit w/ Topcoat can be applied to floors that have been sealed. Before you can use this epoxy, it must be properly prepared, and this would be a step in making sure it was properly prepared. Will the etch remove old oil stains to where the coating will adhere and not effect coating? The etch will not remove any oils from the floor. To remove oils from concrete can be tricky. The best way to do this is to use a diamond grinding machine and to scrub the floor with an oil degreaser. Are your garage flooring materials non-combustible? If some are, which ones? Armorclad Master Kit w/ Topcoat (2 Car Garage Kit) is 100% solids and contains no solvents, which makes it non-combustible. How is the coverage compared to what is advertised. 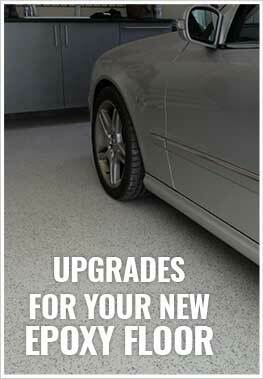 I know of some other products that take twice as much as advertised to cover a garage floor? The coverage for our Armorclad Master Kit w/ Topcoat is as advertised. The coverage of our 2 Car Garage Kit covers 600 sqft when applied according to the instructions. Can you apply your epoxy over the existing epoxy from Home Depot which was applied about 10 years ago.? I will clean very carefully the floor , but the issue is that some guys are saying I have to grind the floor to bare concrete before I apply new epoxy. You will need to remove the old epoxy and prep the concrete floor below it before applying our Armorclad Master Kit w/ Topcoat (2 Car Garage Kit). Pain is in the prep! I really like the easy of application once prep was done. The hard part of the application was getting the flake pattern consistent. I divided flakes onto four buckets. By the time you’re done you just about have the design right. If I had to do again I would divide them into 5 parts not 4. 1 on each fourth of the floor and a 5th to clean up inconsistencies. And go a little light on spreading out. The product dries fast. 30 min ish so get some help to apply. Spread don’t push. Top coat wasn’t too glossy but I didn’t want it be anyway. I also only did one top coat but could have done 2. Easy to apply. Rock hard when it sets. Great looking floor.